What Does A Celtic Cross Mean? The Celtic cross is sometimes called the Celtic sun cross. The basic form of a Celtic cross is a simple cross with a circle around the intersection of the stem and arms. Celtic crosses are connected to all those of the Celtic background. However, they likely began in Gaelic Ireland. It is thought that Irish missionaries brought the Christian religion and the Celtic cross to Scotland, Wales, and parts of England. However, it is not well documented. 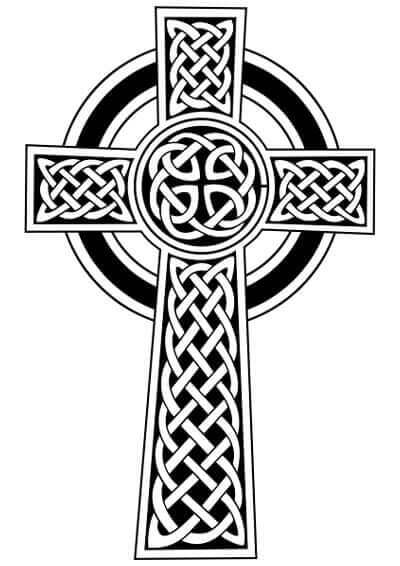 There is a variation of the Celtic cross called the Celtic or Irish High Cross. They have a longer stem than the regular Celtic crosses. They are usually connected to Christian Ireland. They likely began around the 8th century. Irish High Crosses were used to mark religious locations. However, they were used to mark places where a lot of people came together. They were used for a marker for a person who was famous or important. There are a few different things that the circle of the Celtic cross could mean. It could symbolize the Roman god of the sun, Invictus. Those that believe that call the cross the Celtic sun cross. Christians tend to believe the circle is a halo. The halo symbolizes Jesus Christ. Monks that were Christian might have put together the two ideas to make the idea more appealing to Irish pagans. However, there was a practical use for the circle. The crosses that were built and sculpted had a tendency to break at the intersection. The circle would have reinforced the structure. The whole cross would have been stronger. It would have been able to stand up to any weather. The Celtic Cross combined Catholicism from medieval times and ancient Celtic beliefs. Each arm of the cross will represent one of four wisdoms. The circle of the cross will represent the unity of the wisdoms. The center of the cross is the focus. The Celtic cross can symbolize navigation. The cross can act as a compass to guide people through their spiritual beliefs. As a navigation symbol, the Celtic cross can be spiritual, temporal, or cyclical. The cross will help people focus when they feel overwhelmed. It can help move people in the correct direction. It can help people keep their spirits grounded. The cross will represent self, nature, divine, and wisdom with its four arms. The four arms can help to get people to correct their course in life and stay on the right path. The Celtic cross will represent the change of the four seasons. It will symbolize the four fire festivals the Celts celebrated. Fire festivals were very important to the Celts. They symbolized a change for them. They were stable in a world that was not. They used the cross as a cyclical navigation tool. They used them to navigate time. The cross was used to show the difference between night and day. The short, horizontal arm would be a horizon. The top half would be when the sun rises and the bottom half would be when the sun set. The circle of the cross would represent the earth.